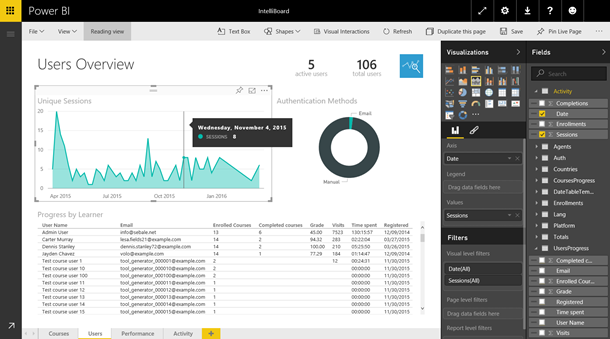 This post will explain how the Power BI content pack can help you explore your IntelliBoard analytics. 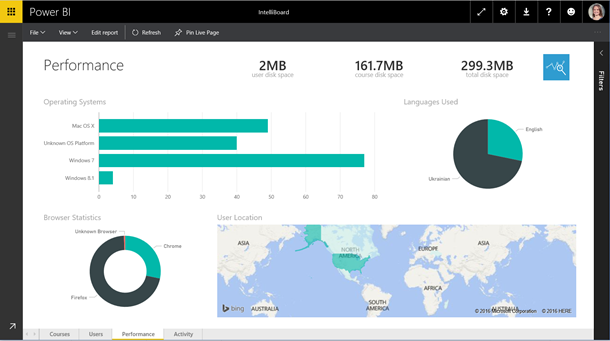 For additional details on how to get started, please see the IntelliBoard content pack for Power BI help page. It’s easy to start using the content pack! Just use your IntelliBoard account information to establish a connection. Once completed, Power BI will automatically create an IntelliBoard dashboard, report, and dataset. The tiles on the dashboard offer an overview of all the insights and metrics included in the content pack. Select any of the tiles to drill down into the 4 pages of reports. Use the tabs at the bottom to navigate through each page. Reports include metrics for enrollments, completed sessions, user breakdown, general activity in your system, and more. For example, selecting the Total Disk Space tiles takes you to the Performance report, where you can see details like which operating systems and browsers are being used, as well as the breakdown by location and language. In each report you can switch to edit mode, where you can edit or add additional visuals to your reports. Hover over visualizations and select them to see additional details. On the right-hand side of the screen, you’ll see a list of all the IntelliBoard tables and fields you have access to in the content pack. Select the visual design, filters, and fields to modify reports or create new ones. From any of the reports you can pin visualizations or tiles to the dashboard by hovering over it and selecting the pin icon. Visualizations from multiple reports can be pinned to a single dashboard, allowing you to combine data from multiple sources and customize your view even further. After the initial import, the dashboard and the reports will continue to update daily, and you can control the refresh schedule on the dataset. 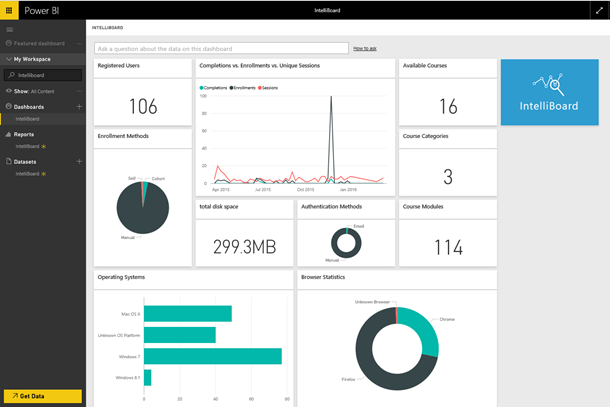 With the IntelliBoard content pack for Power BI, you'll get an initial set of detailed insights that you can use to explore your security data even further.